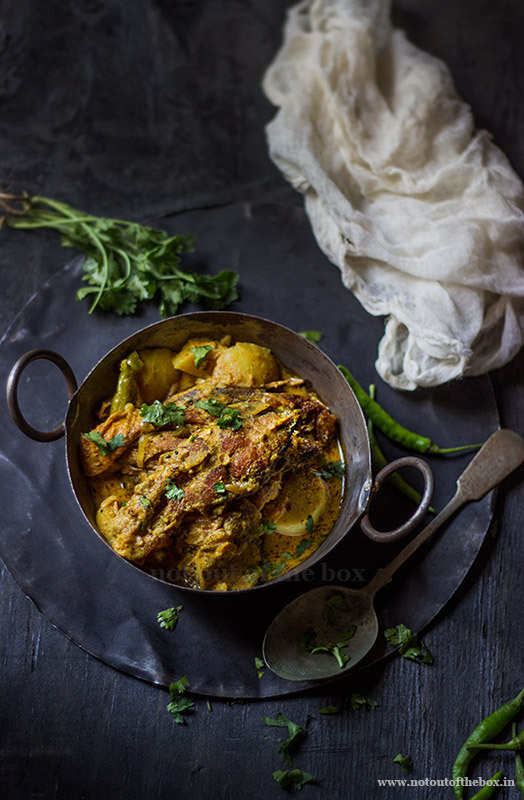 Sorshe Pomfret is a spicy Bengali style fish curry, where fresh Pomfret fish cooked with golden mustard paste and served with a steaming plate of rice. A delectable affair for anyone who loves fish. Mustard paste- 4 tbsp (you can mix yellow and black mustard seeds in equal proportion, if you want you can use only yellow mustard seeds or black mustard seeds for the paste also.) or cook with ready to use mustard powder (cookme or sunrise) available in the market. Keep the mustard seeds on a strainer, wash under running water. Now grind them with green chillies and 1/4 cup water using your mixer/grinder until a smooth paste forms. Peel and cut Potato into halves lengthwise, then cut each half lengthwise into 3 pieces. Wash and keep aside. Rub salt and a 1/2 tsp of turmeric powder on the freshly washed pieces of fish. Heat 1/2 cup oil in a deep frying pan/kadai and shallow fry the fish pieces on medium flame. Keep aside. Now fry the potatoes, let them turn golden brown in color, remove and keep aside. In the remaining oil (3-4 tbsp oil should be there in the kadai, otherwise add some more oil) temper with onion seeds. Once it splutters add onions and sauté them until light brown in color, add 1 cup of water to it. Mix, add mustard paste, 3/4 tsp turmeric powder, kashmiri mirch powder and salt. Mix well and give this a quick boil on high flame. Once it boils lower the flame, add the fried fish and potatoes. Cover and cook on low flame until potatoes are done (12-15 minutes max). Check salt and turn the heat off. Garnish with freshly chopped coriander leaves. 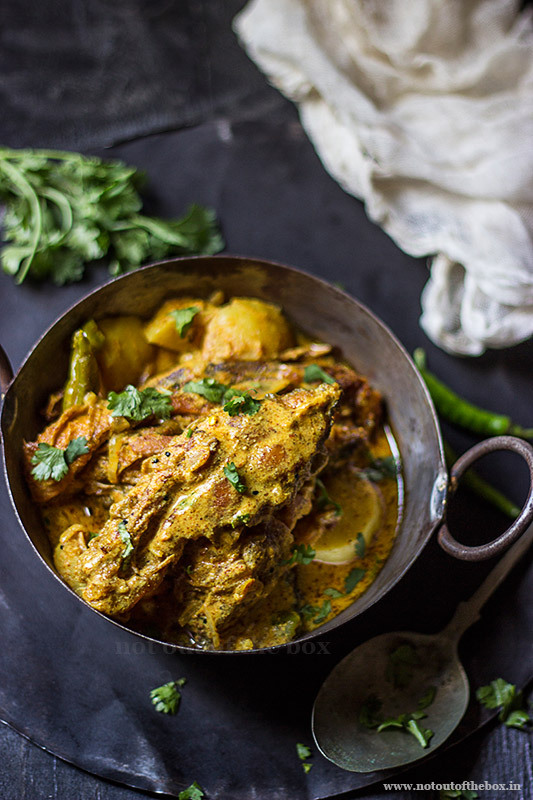 You can replace Pomfret fish with any other fish of your choice in this recipe.